Today I got an email from the the Baltic International Summer School (B.I.S.S at HafenCity Universität Hamburg, HCU) with a link to the newly (online) published book about the workshop in which I was a participant in the summer of 2016. The topic of the workshop was “Urban futures – think the link”. But my group went so far to explore the missing link – “What if bridges die?”. We tried to imagine the identity of the bridge in the future, but the architectural and structural identity of a bridge might be completely different from how we perceive it today. Then what will remain of the bridge’s identity? Imagine that the function and identity of the bridge today is no longer the same in the future. That’s when the bridge of today dies. That’s where my group started to get a little crazy. And me, I got quite carried away with acoustics and structural dynamics of bridges. Because I am a structural engineer, architecture nerd after all. One of the identities of a bridge, which will never change, is it’s sound identity. Or rather, it’s frequency? Because vibrations of the bridge are determined by the physical reality. But sound waves are not physical objects. And this is really what get’s me going about acoustics, sound and structural dynamics. Sound is something we cannot touch or see, but it has the ability to transform matter, move it, and it can also seemingly defy gravity and black holes. This was after all the whole topic of my bachelor thesis, where me and my project partner Gustav explored black holes in space and designed an auditorium based on the concept of a black hole – gravity, the event horizon and the singularity. It was all based on the super massive black hole in the Perseus cluster which is “singing”. However, back to B.I.S.S. Me and my group explored the soundscapes of bridges, and the non-physical spaces created by sound! Our project was a very abstract and artsy project, but also anchored in science and technology, since our project was all about acoustics and dynamics. A perfect architecture and engineering approach! We recorded the sound of bridges, and with the help of the plugin Mosquito for Grasshopper it was possible to import the waveform of the audio into Rhino. 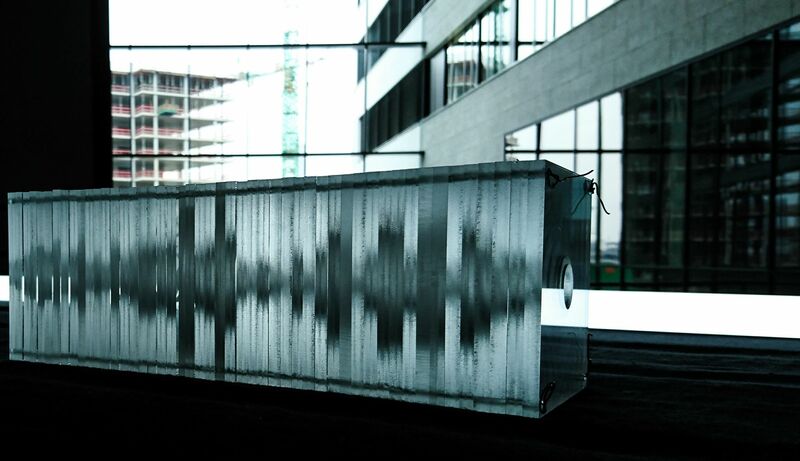 Based on the wave form we created a digital and physical representation of the sound.